Ever since Yakun decided to cut on its quality and serve slip shod toast, I have been trying to find new and reliable places to have my toast fix. In my previous post, I mentioned that I really love the Butter Sugar Toast at Toastbox. No, I have not knocked it off it’s pedestal, but allow me to recommend this other place that also serves wonderful toast, although different from the Yakun and Toastbox types. 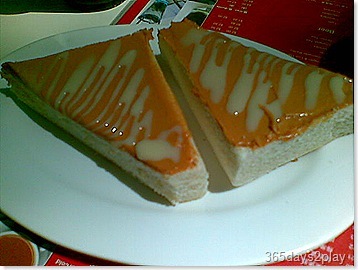 Let me recommend to you the humble Peanut Butter and Condensed Milk toast from Old Hong Kong Cafe!! Frankly, I can’t decide which I like more, the Butter Sugar one, or this one, although I would probably say perhaps the Peanut Butter one is slightly healthier? The combination of sticky peanut butter combined with the sweet condensed milk on an ultra fluffy toasted piece of white bread, it’s just simply wonderful!!! I actually don’t think you can find this anywhere else in Singapore, although it would not be difficult to replicate it if you request for it. That above is definitely not for those unfamiliar with condensed milk. I took it upon myself to personally recommend this to several overseas visitors, and I could positively see them gagging at the thought of eating liquid sugar. (It’s not that sweet I think! I would have preferred more condensed milk!!) And this is not some new-fangled thing because my father loves it very much too, possibly more than I love it! Ok anyway, well apart from the toast, Old Hong Kong Cafe, being like any other HK Cafe, has about 200 (or more?) other items on the menu. It used to be the cheapest HK Cafe around, but it has since revised its prices about $0.50 – $2 upwards. Still, this is my favourite HK Cafe. The food tastes better, the seating is more spacious and they just seem to exude a slightly different vibe as compared to the other more “generic” HK Cafes. The toast above now costs $2. A cup of HK Milk Tea also costs $2. If you spend above $5, they give you a little chop on your loyalty card, which you can redeem for a free drink after 5 chops. And if you spend above $50 on a single visit, they give you a free chicken dish on your next visit. Oh btw, although it’s a Hong Kong Cafe, do brush up on your Mandarin as most of the serving staff are from China. « Always read the labels!! !